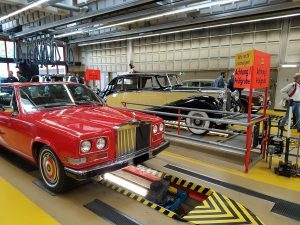 Club President Jurg Bihn was kind enough to extend an invitation for Easirider to attend the Swiss Section’s annual get together at the Schafisheim MOT Centre near Zurich. Members are invited to bring their cars to the spotless garage complex where they can inspect their vehicles and get maintenance advice from specialists. The event attracts a wide cross-section of R-R and Bentley models of all ages. All in all it was a fascinating day topped off with a delicious spaghetti bolognese served Swiss style with apple sauce.